I’m here in Idaho for the annual meetings of the Wesleyan Theological Society. Yesterday, Northwest Nazarene hosted a pre-conference event titled “WESLEYTALKS” (using the model of TED Talks). In addition to a number of video presentations and discussions, we had a series of afternoon workshops. I made back-to-back presentations of the Industry Evangelicalism and Testimony Evangelicalism distinction I’ve been blogging about. I wasn’t sure how it would be received because it was the first time I’d unpacked these ideas when people could actually see me, challenge the presentation, and ask questions. My presentation was built around a series of geologic metaphors. My overall point was that there is a massive shift going on in evangelicalism. It is a move from Industry Evangelicalism, based on structures both physical and sociological, to Testimony Evangelicalism, based on authenticity and interpersonal engagement. Just as the movement of tectonic plates gives rise to volcanic eruptions and earthquake activity, the shift in evangelicalism’s tectonic plates gives rise to various crises, conflicts, and concerns. In other words, the visible activity is a result of the underlying movement. 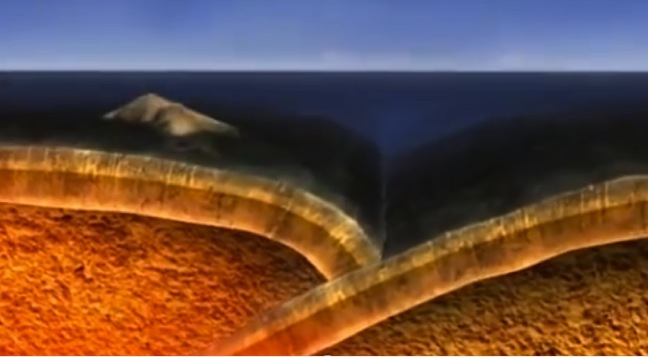 To understand the volcanic eruption, we need to understand the underlying geology. To understand the latest evangelical twitter fight, we need to look beneath the surface. The presentation wove together a number of sources I’ve written on before but never tied together quite as well. I worked through the component parts of Industry Evangelicalism, based on boundaries, structures, charismatic leadership, conformity of followers, and a general combative stance with the broader culture. This is part of what Putnam and Campbell’s American Grace spoke to and is also reflected in much of Molly Worthen’s Apostles of Reason. Putnam and Campbell describe the building of evangelical infrastructure as the first aftershock (another geology reference) to the earthquake that was the 1960s. While Worthen’s timeframe starts earlier than that, her book similarly places the expansion of evangelical visibility in the same era. But earthquakes and aftershocks create damage. That damage results in instability. And in some cases, the best we can do is to construct complicated scaffolding to protect the institution from further damage. I used the pictures below as an illustration. This shows the National Cathedral in Washington, D.C. following the August 2011 earthquake. Part of the damage done by Industry Evangelicalism is seen in declining percentages of Americans identifying with evangelicalism in national polls and the dramatic rise in religious “nones” among the millennial population. I suggested that Testimony Evangelicalism is the emerging understanding that subsumes the Industry tectonic plate. Testimony Evangelism, as I’ve written before, is based on story and interpersonal engagement. It affirms contact over boundaries and puts a priority on authentic and ongoing relationship. Here is the image I’ve adopted to represent Testimony Evangelicalism. 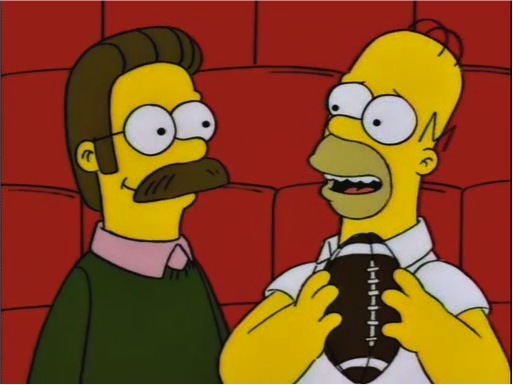 There’s just something about Ned Flanders. He may be one of the most clearly evangelical characters on television. Sure, he can be kind of nerdy and Homer and Bart enjoy picking on him. But Ned never goes away. He keeps building that relationship with Homer and the family. He tries to enter into their lives even if they don’t fully understand his. I observed that Ned’s approach is in sharp contrast with Rev. Lovejoy, the other expression of a person of faith (there’s another blog post in here for sure). When I reviewed the Worthen book, I observed that there were always alternative voices to those building Industry Evangelicalism. Because I was at a Nazarene school, I especially celebrated the role of H. Orton Wiley and Mildred Bangs Wynkoop. They were forerunners of my Testimony approach. Putnam and Campbell see the rise of the religious nones, especially among the millennials, as a response to the organizational structures of Industry Evangelicalism (watch Jeff Bethke’s “Why I hate religion but love Jesus”). This is consistent with the argument David Kinnaman and Gabe Lyons make in You Lost Me. I suggested that we could begin to see how Testimony Evangelicalism could work if we simply took Kinnaman’s themes describing the estrangement of millennials and reversed them. Instead of being over-protective, it would be known as a place of trust. Instead of focusing on pat answers, it would wrestle with complexity and tolerate ambiguity. Instead of being concerned about science or societal changes, it would give freedom for hard conversations. Whether within the community of believers or among those outside the church, we imitate our creator and redeemer; we pursue each other, identify with each other, and direct our lives toward the flourishing of each other through sacrificial love. This is the style best representing Testimony Evangelicalism. I had a good crowd in both sessions. Most of those attending were pastors and lay leaders from the region. I wasn’t sure what to expect. But I was absolutely thrilled by the response both in the discussion period that followed by presentation and conversations I’ve had over the past 24 hours. Church leaders, at least those who opted to spend some time at a theology conference, saw this shift from Industry Evangelicalism to Testimony Evangelicalism as a sign of hope within their ministries. I was asked what we could do to get denominational leaders to pay attention to the argument, but there was also a recognition that this just might be the old form of the question. One of the most encouraging moments happened at dinner last night. Bob, a senior pastor in Washington, told his district superintendent pretty much the entire presentation and recommended it as a topic for future meetings. More important, he told me he wished he was just starting his 40 year career today because the opportunities are so bright. It’s what happens when we faithfully give people the opportunity to speak authentically.